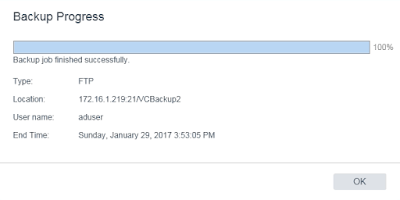 VMware VCSA 6.5 Backup and Restore How-to. Note that it is an “out-of-the-box” feature which does a file level backup. It’s “built-in” within the appliance itself, and it allows users to backup not only the vCenter Server but also Platform Services Controller (PSC) appliances directly. VCSA with embedded or external Platform Services Controller (PSC) is supported. As you might imagine, the restore has to be launched from somewhere. When you’re in a situation when your VCSA is broken, you’ll have to first deploy clean VCSA via the Installation/deployment ISO, but you do that within the restore operation. Log in with the password you entered when you have deployed the solution. You’ll see this nice new UI…. After you log in, then you can hit the big Backup button. A wizard will start…. There you’ll be presented with a nice wizard which will allow you to specify where you want to send this backup. The location must be an empty folder. Note the option to encrypt your backup data, a simple check box. NOTE: If you use HTTP or HTTPS, you must enable WebDAV on the backup Web server. The Encrypt Backup Data checkbox, when checked, a new section appears inviting you to put login/password combination. The password form is intelligently checking if you enter twice the same password. If not, you have a small notification telling you that your passwords do not match. And then I entered the backup setting, such as protocol, login/password combination (make sure to give read/write rights on the folder where you’re backing up) > and finish the wizard. which gives you services which run on one line, and also services which are not running. The “vmware-stsd” service should be normally running. Deploy a new appliance using the wizard.